Yesterday we had to wake up and travel almost six hours round trip for a family gathering, which meant we had to wake up early, get dressed and hurry out the door to meet everyone before noon. If you know me, you know that I am last minute, down to the wire and queen of procrastination. I should have had clothes picked and laid out the night before, but of course that didn't happen. 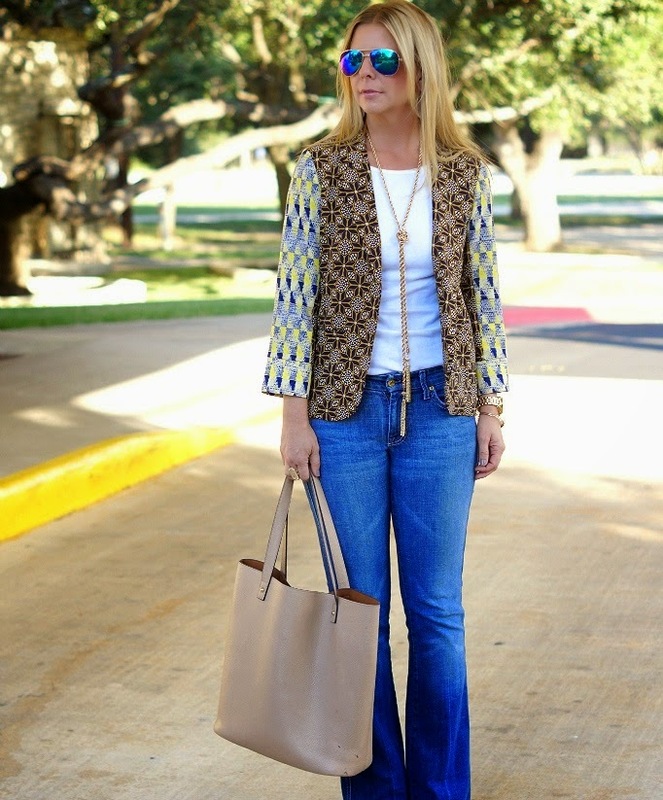 I purchased the printed blazer last week from one of my favorite Austin boutiques, Beehive. It was still hanging over my bathroom door and the first thing my eyes focused on when I rolled out of bed. Naturally, not thinking twice, I grabbed it and paired with basic additions for a quick and easy style. A blazer, simple white tee, a trusty pair of denim, fun heels and a few jewelry favorites will always see us through the "gotta get dressed in a flash" moments. It's foolproof. Always. I can't decide which one I'm more in love with… those gorgeous prints or your amazing flare jeans? That blazer is amazing....totally in love with the fun patterns! That blazer looks like it was made for you. Love, love, love it! Perfect! So important to have that "need to get out of the door in a hurry" outfit! Love this! Your legs look so fabulously long, hot mamma! I adore printed blazers! Love how you kept accessories minimal so the blazer can really shine! Beautiful! Stunning look! love everything including the sunglasses! This outfit is adorable and I LOVE that blazer. Oh this formula really is foolproof! 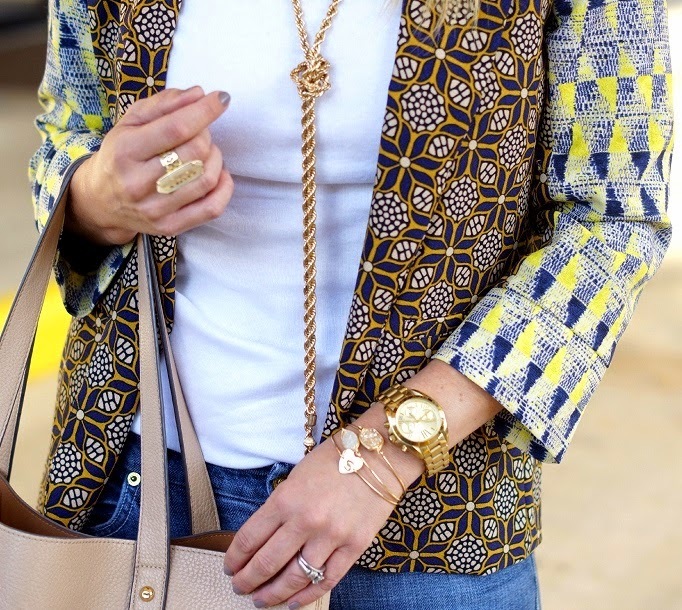 That printed blazer is such a statement maker! Having a snazzy statement making piece on hand really is so helpful when you're needing a quick and knockout outfit! Love that blazer! You are nailing it with the style posts lately. 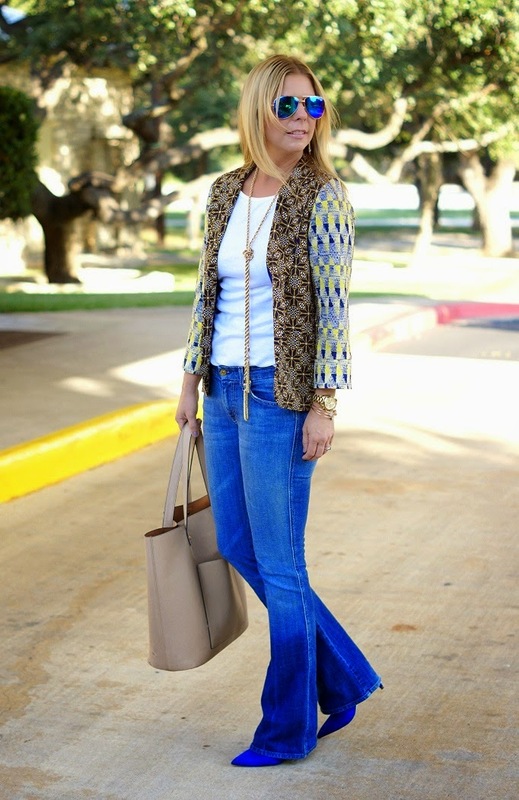 I love every aspect of this outfit from the bold shoes to the bell denim. Perfection. I am loving the flare jeans. I love skinnies and boyfriends, but it's nice to have other options. I usually can't find any for my height without alterations (and I'm lazy). And love the jacket. I'm pretty impressed that this is a last minute outfit choice! I love the flared denim. If you had worn skinny jeans it would have been cute but...something most everyone else would have worn. Just adding the flares gave this a unique spin. I'm pretty sure all you need in life is a good blazer - And this one is soo cool! It totally steals the show. its all about the feet, what a great colour.. loving the blazer, tat could really go casual to dressy , play to work. Such a winning look, which Rachel Zoe will approve, I might say!! Love this blazer and hello necklace twin!! :-) Hope you are having a wonderful day! This blazer is pretty darn fantastic! You look amazing in those flared jeans too, not too many people can pull those off (I sure can't)! An amazing statement blazer like that deserves the best classics & you exactly put in the best ones like those flared jeans - DREAMY!!! Such a fun blazer! Definate statement piece! Loving this blazer! For hurrying out the door you look great! I bet the girls did too!